In part following ideas in the book about advanced healing for sub-personalities, I conducted a self-ceremony on the land. I wanted to share a little about it, as we all have our versions of Inner Loyal Soldiers, & this is something we can all do for ourselves. It is also something we suggest and/or guide in our deeper Wild Nature Heart programs, like Wilderness Vision Quest. It kinda blew my mind (or rather, enlarged my psyche). Long story short, I thanked them for their service, loved them, then re-commissioned and enlisted them for my greater purpose. One thing about these energies in us, is that can’t simply be banished. But we can approach them with the trust and love of our bigger selves and have a new relation to them. Because of their long-time devotion, hyper-vigilance, & vitality (which previously could keep me small), why not point them in the right direction? Now their prodigious powers could assist in becoming bigger, more balanced, more aligned. I was also surprised to discover that there was a component of Shame that existed as part of a sub-personality. Whenever my friends talk about their experience of Shame, I always denied having that emotion. So it lived in my Shadow—in coming to light I was able to transform, then re-channel the energy. The shame had to do with my sensitivity, or rather the message from others from early on in my childhood over my ‘over-senstivity”. However, I know that sensitivity to my inner system and outer systems (often mirroring each other) is one of my super-powers, without which I could not do the work that I do. Historically, I have had an overblown West Shield, the Muse/Beloved, & under-developed other shields. Now, after a lot of self work, while West is still easy access for me, I am (I think!) much more balanced in each directions/facets, and live in the space of Big Trust. It is part of my work to continue deepening and balancing each facet of my psyche, and help others do the same. I invite you to explore Bill Plotkin’s soulwork, and experiment with dialogue with the parts of the psyche that used to serve you as a child, but perhaps make you small or less vibrant now. How can they be re-visited and re-purposed, so that you can live your most fulfilling and authentic life, and give your gifts back to the world? JOIN ME, JOANNA MACY and 12+ diverse, inspirational leaders in the FIRST EVER ONLINE ECOTHERAPY CONFERENCE. Learn practical tools and inspirational concepts to catalyze your next steps in nature-connected work! In a culture that seems intent on separating us from nature and our truest selves, we all need supportive community to continue our work of nurturing relationships with nature. I (Ryan) have long had a personal and deep relationship with wild nature, but it was only a couple years ago that I found that I was being called to share that sacredness and the ways in which it can create space for healing and growing into our biggest selves. Before Katie and I co-founded Wild Nature Heart last year, I began my first experiments in bringing people together to re-connect to each other, to wild nature, and to our deepest selves, most often in the redwoods and creeks in what I call the Nearby Faraway, just on the edge of the town. I saw myself as being a co-guide with nature, on the threshold between the city and the wild, and finding that people were not merely wanting that, but needing it, as a balm for their overwhelmed and distracted lives. Not merely as some place they could go to, but as a more-than-human community, with whom they are related, and to whom they belonged. Here they could slow down, they could listen to their bodies and inner voice, with nature as ally. Since then, we both have found our tribe and a whole field of practitioners doing various amazing and important nature-based projects across the world. Now we have colleagues, clients, and an earth-loving community which has helped us continue to live and teach from a deep place of connectedness to the Earth and to experiment with soulful and earthy offerings. But we know how challenging it can sometimes be to integrate your love of nature into your life and profession. And we also know how deeply satisfying it is, and how crucial it is for the survival of humans and more-than-humans to shift the mainstream culture to a nature-honoring one. 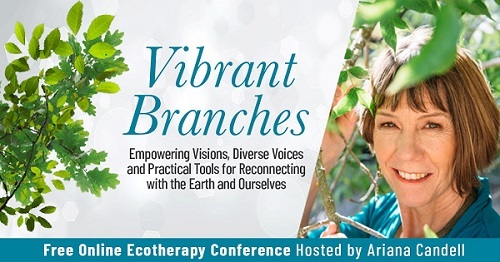 That’s why I was so excited when Ariana Candell, founder of The Earthbody Institute and Ecotherapy Certificate trainer, invited me to be an expert in her Online Ecotherapy Conference: Vibrant Branches: Empowering Visions, Diverse Voices and Practical Tools for Reconnecting with the Earth and Ourselves on October 27. I was so glad to join two extraordinary and earthy practitioners (Adriel McCluer and Beverly Ingram) on our panel and we were able to talk about the world we envision and approaches to re-connecting. I’m also thrilled about the rest of the stellar and diverse line-up, including earth elder Joanna Macy and The Work That Reconnects, Pinar Sinopolous-Lloyd of Queer Nature, and Victor Lee Lewis of the Radical Resilience Institute. I will be inspired and learning a lot from them, as I think you will too! Joanna Macy’s “Deep Time” concepts of calling upon the powerful wisdom of the ancestors and future beings to support you in these challenging times. Why it is crucial for Ecotherapists to shift the paradigm from the mindset of using the natural world for healing, to one reciprocity and respect. How to include people of color and marginalized communities in nature connection work. Case studies and interventions from seasoned ecotherapy practitioners about how to work with trauma, refugees, veterans, and inner city children, to name a few. How to grow your nature-connected business organically from seeds, to roots, to fruit with the “Natural Business Cycle”. Join me and 12+ inspirational leaders who can help you to take the next steps towards your nature-connected work in the world and feel part of an earth-honoring community that is making a difference on our planet. I hope you’ll join us! Reserve your free spot. We’re excited to announce that Ryan’s book Re-Membering: Poems of Earth & Soul is now live and available! Re-Membering has 75 earthy, soulful poems in it. If you are a nature and poetry lover, we think you will love this 🙂 May the poems in Re-Membering inspire your fierce and big wild nature hearts and be a small part of The Great Turning. The poems in Re-Membering are about evoking that gasp of memory. To re-member is not only to recall the treasures that have been lost to forgetfulness, but about re-integrating the body and soul, putting the members of our whole selves back together, and to re-belong ourselves to the vast and beautiful and endlessly fecund home we call earth, to become full members again in the great earth community. It’s deep summer–sun-kissed blackberries, cool water, hot skin, Venus nights, toes in the sand, playfulness. We’re right there with you! We wanted to let you know about three different opportunities to deepen your connection with nature and your wild soul calling that we are offering in these next few months: a Wilderness Backpacking Journey, a Writing Wild Workshop, and a Vision Quest. 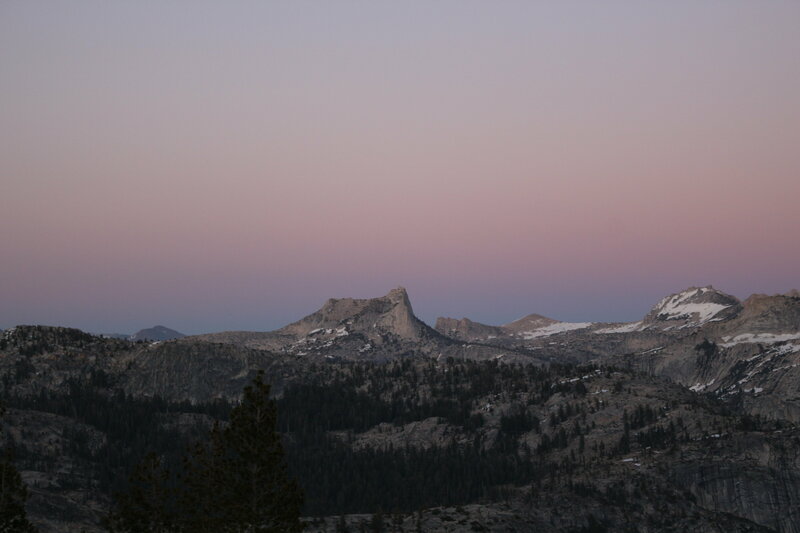 Say Yes to Your Wild Nature Heart Backpacking Journey, August 22-26. We just returned from the Yosemite high-country, scouting locations for some of Wild Nature Heart’s upcoming journeys, including the one coming up next month, our final mountain adventure for the summer. It’s simply stunning and unbelievably peaceful up there. We had some inner and outer wilderness adventures of our own, including creek therapy, fire night, lake swimming, cross-country orienting, and oh yeah, the marmot that stole our socks. We’re pumped to bring people up on the mountain! Are the mountains calling you? Writing and nature a good allies and good medicine. We invite you to spend a day in nature to explore the magical alchemy that can happen when you take the time to slow down, be really present to the natural world, and then write from that place. The voice of your true self does not give up easily. It’s been whispering to you, maybe for a long time, and maybe the time to listen has arrived at last. The modern day vision quest is a new-old practice of setting time aside in sacred ceremony to be by ourselves in wild nature in order to leave behind the voices of the world, cross over into a liminal space where our senses re-awaken and we are able to re-member our place as a part of and a-kin to nature. Wild Nature Heart’s wilderness vision quest program involves 2 days of preparation, a 24-36 hour solo fast, and 1 day of incorporation before returning home. The fast is not only from food, but from news, devices, and other ways we can distract ourselves. Our programs are small (group of 4-6 participants), to ensure an intimate setting. Nature is the Master Teacher. One of the biggest lessons is that change is a constant and movement is perpetual–nature unfurls the next moment/season/image out of the old. This applies as much to the movement within–can we be present with this ever fascinating dance? Our Wild Nature Hearts are rich from spring nurturing and swelling with the unfolding summer season. In April, we marked spring with a powerful EMERGENCE weekend of nature, community, and soul witnessing. It feels like yesterday we were sitting in the meadow together in council circle with the sun on our backs, creating nature art, mirroring, sense walking, and singing and sharing around the fire. It was such an honor to share time in sacred circle with 7 other people on the land! We all returned nourished by each other’s soul stories and a connection with the earth community. The mystery of how it is that the exact right people show up to weave the tapestry of interconnected stories continues to astound us. And it’s what feeds us as we create new programs. Now, spring is ripening into summer and Wild Nature Heart too is ripening with summer programs that celebrate wholeness, affirm our sensual bodies, and embrace our big dreams with purpose and playfulness. Many summer fruits are growing, but we are excited to announce two of our juiciest: Say Yes to Your Wild Nature Heart July Wilderness Journey and our Claim Your Wholeness and Soul Calling Individual Mentoring Packages. Of course, we are also continuing to expand our free themed Meetups along the American River in Sacramento and the redwoods in the Oakland hills. Ryan is offering custom-designed 1-5 Night Individual and Small Group Guided Soul-rooted Wilderness Journeys during parts of July through September–Contact us with your dates and needs. Click here for a glimpse of more upcoming 2018 programs.